I have, over the years, received countless emails appealing for this and that. From blood donation of a certain blood type to adopt a puppy. So of these emails can be real heart-tuggers but given that there are so many hoaxes and pranks out there, one cannot but feel skeptical or worse, cynical about the whole deal. Even if the email was genuine, I am more or less pretty much unmoved as I don't feel anything towards the subject, be it a person or a thing as it is far too remote for me. That was until that morning when the following email reached my mailbox. This one really hit home. To my friends and all who are reading this here. I know it is a long shot to ask if you can answer to call for help as well as to help spread the word by plugging this. It is a lot to ask. Believe me, I know. Isn't it ironic that I am making an appeal for help while all along I have always been the skeptical one? Oh how God has a way of humbling the arrogant. I was diagnosed with leukemia 2 months ago, and my girlfirend Jolene is helping me to organise a bone marrow drive. Thankfully, whilst we were organising this drive, my brother (and only sibling) was found to be a match. Nonetheless, we are still going ahead with the drive to help other patients in need. I sincerely hope that you can come, as well as forward this email to as many friends as you know. 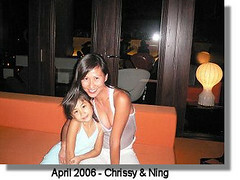 A s some of you may know, my friend, 32 year old Chrissy Tan, was diagnosed with leukemia about 2 months ago. 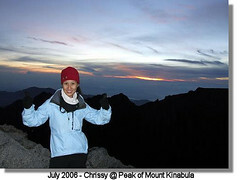 A vibrant and energetic sports enthusiast with a real passion for life, her latest expedition just before the diagnosis, was to Mount Kinabalu. Sadly, she will have to put her life on hold for now as she takes on treatment for her illness. She has since undergone her second round of chemotherapy and will have to complete 2 more rounds of chemo in addition to radiation therapy to fight the cancer. We are all certain that with her relentless spirit and will to survive, she will emerge victorious! 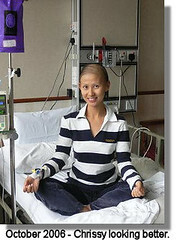 However, to increase her odds against this great force merciless malady, a bone marrow transplant would be ideal. There are many other leukemia patients out there who also face the same battle. 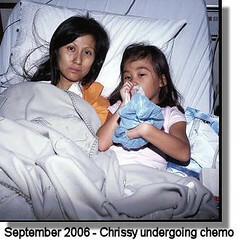 Leukemia is the most common form of childhood cancer. Many child leukemia sufferers die while waiting for a matching donor, never having a chance to live life to their full potential. BUT - YOU CAN HELP! Help them to beat the odds by increasing the database of Bone Marrow Donors. The more people that are added onto the register will mean higher the chances of finding a match for these patients and giving them the most precious gift of all - A gift of life. Registering yourself only requires a little prick on the finger for them to process your blood typing and IT'S FREE! To make it even easier for you to register, we are conducting a Bone Marrow Donor Drive . So just click on the reply button and say YES you're coming! We just need to know the number of people to expect. Parking is in abundance just outside the spa. Nearest MRT stations are Ang Mo Kio and Bishan. Bus services that stop at Bishan Park are SBS 133, 136 and 232. Do call or send me an sms to confirm attendance at 9187 3888. Please feel free to drop me an email or call me for any enquires! P/s: Please forward this to everyone you know. The more the merrier! P/P/s: The bone marrow harvest is also not that scary - any healthy individual aged 17-50 years of age can do it! I'm the biggest scaredy cat in the world so if I put myself down for this, it should be easy peasy for the rest of you ;-) Here is a link to some Frequently Asked Questions about bone marrow donation http://www.bmdp.org/how.php?q=3#7 , and also a short introduction on how bone marrow is harvested. SPECIAL ANNOUNCEMENT: We are pleased to announce that in the midst of organising this drive to find a bone marrow donor for Chrissy, her only sibling was found to be a match to her. However, as there are still many, many other leukemia sufferers out there who have not found a match, we will continue to conduct this bone marrow drive to give more hope to these patients. A bone marrow harvest takes place in a hospital operating room, usually under general anesthesia (i.e. unconscious). It involves little risk and minimal discomfort. While the patient is under anesthesia, a needle is inserted into the cavity of the rear hip bone or "iliac crest" where a large quantity of bone marrow is located. The bone marrow a thick, red liquid - is extracted with a needle and syringe. Several skin punctures on each hip and multiple bone punctures are usually required to extract the requisite amount of bone marrow. There are no surgical incisions or stitches involved - only skin punctures where the needle was inserted. The amount of bone marrow harvested depends on the size of the patient and the concentration of bone marrow cells in the donor's blood. Usually one to two quarts of marrow and blood are harvested. While this may sound like a lot, it really only represents about 2% of a person's bone marrow, which the body replaces in four weeks. When the anesthesia wears off, the donor may feel some discomfort at the harvest site. The pain will be similar to that associated with a hard fall on the ice and can usually be controlled with painkillers. Donors are usually discharged after an overnight stay and can fully resume normal activities in a few days. a reminder of how fragile our lives are... take care! Lady Jac: Indeed we are. You got me thinking about death and this is what I feel. I don't think anyone is afraid of the Grim Reaper. It's the lack of preparation i.e. things we have not fulfill before we go that scares us. I also delete all these mails after I receive it. I guess this is an alarm to everyone of us that we should at least read thru the content before we trash it just in case there is someone we know that might need our help or maybe we can help too! Sunflower: It's a catch-22 situation as far as trying to filter the real ones from email spam. I too, must admit that I am guilty of the skim-and-trash. I supposed I would have to fine tune this to at least pay attention to trusted sources from now on.